Lunt Solar Telescopes, Solar Filters, & Accessories Catalog. This is the complete twenty-three (23) page color illustrated document plus cover sheet as prepared by Company Seven, so this is provided solely to those who have acquired Lunt or other telescope equipment from us. Document provided as a moderate resolution Adobe .pdf file (26,876,625 bytes). Download Link provided to our customers only by E-Mail request. Lunt Solar Telescopes, Solar Filters, & Accessories Catalog (Hi-Res). This is the complete twenty-three (23) page color illustrated document plus cover sheet as prepared by Company Seven, so this is provided solely to those who have acquired Lunt or other telescope equipment from us. Document provided as a higher resolution Adobe .pdf file (56,837,949 bytes). Download Link provided to our customers only by E-Mail request. Right: Lunt LS60THå 60mm Hydrogen-alpha solar telescope, shown outside Company Seven 23 March 2013 at another of our routine "Solar Saturdays" activities (151,745 bytes). Telescope operating at 0.7Å bandpass with single interference Etalon (without double stack component). 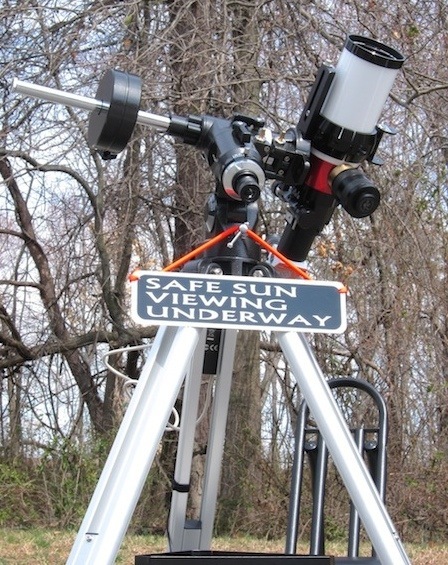 The Lunt telescope is supported by a lightweight and economical (yet well suited) Orion brand motorized German Equatorial Mount and aluminum Field Tripod; the entire set can be carried as shown assembled by an average adult. Click on image to see enlarged view (382,902 bytes).